Our recent trip to Andalusia has been full of adventures and new experiences and we will definitely return in the future, but it has been disappointingly poor in terms of new bookstore additions. This was partly due to the fact that the larger part of our trip took place during the Holy Week or la Semana Santa (the week before Easter), which means that most business were closed. However, although tourism is the main source of income of this entire region, it must be very hard to get by without at least some knowledge of Spanish as the locals only very rarely speak any English. English books are also hard to find, so Vértice International Bookstore in Seville is a bright exception. Seville today is a major tourist destination with an amazing historical heritage and is a modern cosmopolitan city which has a lot to offer. Many people date its recent rise to popularity among the tourists to the successful Universal Exposition of Seville which took place in 1992 to mark the 500 years of Columbus's discovery of America. Vértice bookstore predates this event by full two decades, it was opened in December 1972 and slowly started building its reputation. Through the years, Vértice has profiled as a specialist in foreign language books and has welcomed some prominent visitors as well, such as Mario Vargas Llosa and William Golding. Our first attempt to visit Vértice failed due to siesta - the bookstore is closed between 2 and 5 in the afternoon. 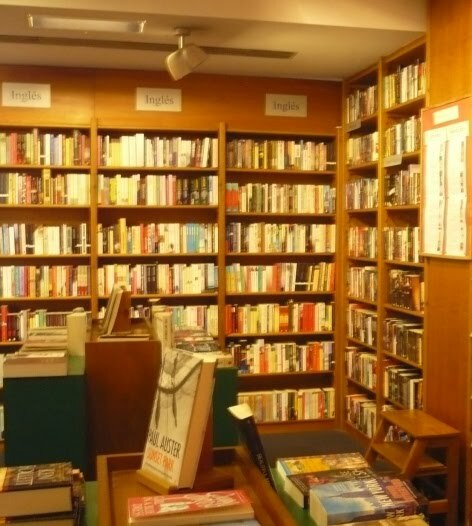 We were more successful on the following day and the bookstore was really worth the return trip. Vértice International Bookstore is not exclusively English, it has a polyglot stock. The bookstore is located close to the impressive building of the university, which is in fact the old Tobacco factory building made famous by the opera Carmen. It is hard to miss as it also has a separate side window display where you can see a selection of titles in different languages. Vértice offers books in English, German, Italian and French. General fiction (with all the latest novels), but also ESL materials, dictionaries, travel guides, biographies and also books for children are available in these languages. 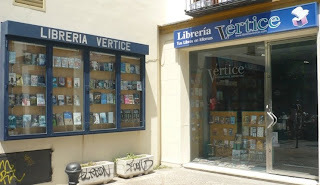 In addition to that, Vértice offers a smaller selection of titles also in Russian, Portuguese, Greek, Arab or Japanese.